Rezrobics is a video providing health and exercise information that comes with a second video designed to make light of the first. Here's a great video created by Gary Rhine about exercise and eating right. The video is freely-available to American Indians and a $40 donation for the rest of us. My guess is that most everyone can use the information this video contains. I'll let you know more when my set arrives. Diabetes is a serious problem in Indian communities as a result of the nutrition-poor commodity-based diet that they were forced to survive on since around the turn of the last century, when Indian people were forced onto reservations and forbidden to hunt or fish. The government promised to provide whatever food would be needed and did so with commodities; primarily white flour, white sugar and lard. A high sugar, high carbohydrate, high fat diet for the last 100 years has caused type two diabetes to become quite commonplace among Native American populations. 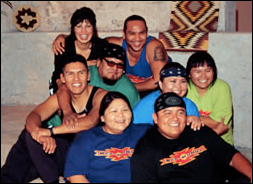 The videos are available free of charge to those of American Indian descent. A $40 donation is requested for non-indians. Order Now! Copies of the videos are being distributed free of charge throughout the Indian communities of North America. While Navajo Health Promotions distributes on and around The Navajo Nation via clinics, schools and video stores, DreamCatchers oversees distribution to the rest of "Indian Country". There is no FBI warning on the programs. Instead, the opening message states, "Please make copies and give them to your friends and relatives". Thanks for this page! Hope everyone is feeling good! We have a new Native Weight Lodge egroup for those who want to get in shape!! Check us out..and I sent the group your links too!